State Road A1A in Flagler Beach, Fla., ideal place to ride a motorcycle. When brother-in-law Bill announced he was flying in for the weekend, my wife suggested that instead of hanging around the house we drive up to a beach house owned by a friend of hers. 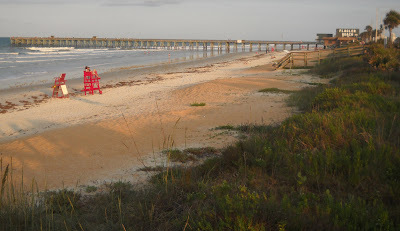 The house is in Flagler Beach, Fla., a laid back little town north of Daytona Beach. It's one of those rare Florida communities so small you can park for free, right along the beach. 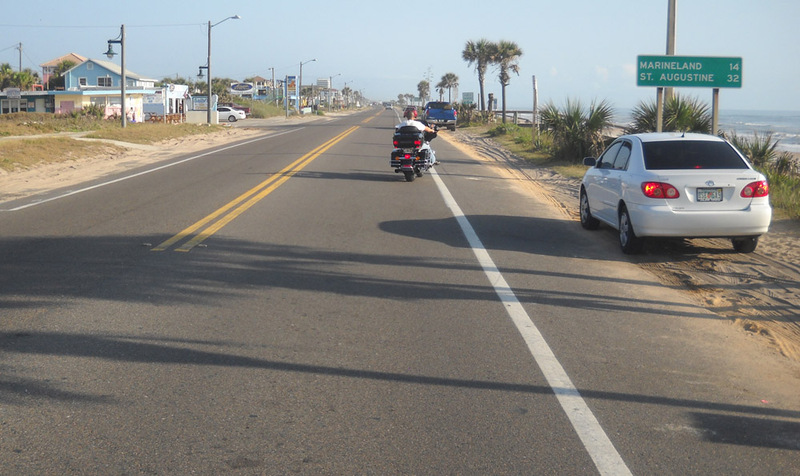 This time of year the broad, flat beach is nearly empty and so is State Road A1A, which runs along the shore. It's an ideal place to ride a Royal Enfield motorcycle — but my motorcycle would have to stay home. 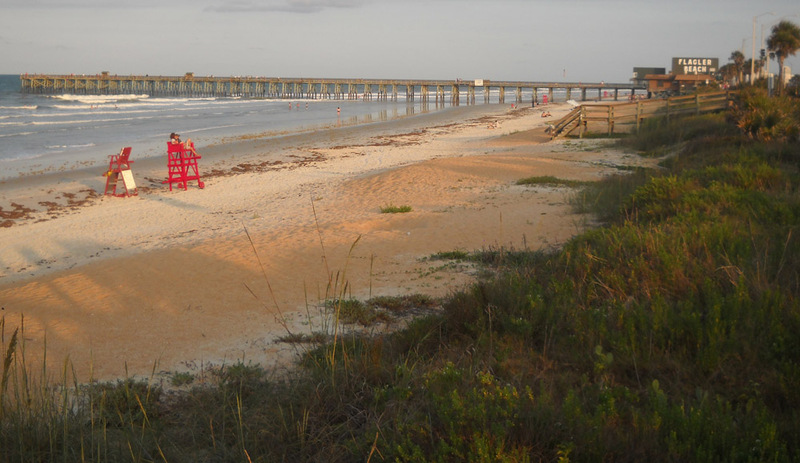 Flagler Beach has a pier and plenty of room for your beach towel. "My friend says there are all kinds of bicycles we can ride, in the garage," my wife said, when we arrived. "We just have to pump up the tires." Bill opened the door to the garage, to check on the bicycles. "Did your friend say anything about the Harley-Davidson in the garage?" he asked. I instinctively dropped my eyes back to what I was doing, and said nothing. This is precisely what I do when a beautiful girl unexpectedly walks through a room. It's impolite to stare and it feels disloyal to want to do so — harrumph, married man, after all, mere child, young enough to be a daughter, so forth and so on. After a moment or two, of course, one naturally looks up and, should she still happen to be in view, well, then, it would be impolite not to gently include her in one's gaze. Wouldn't it? So I let a moment or two elapse before getting up and casually stepping to the door of the garage. I almost staggered back. Instead of the over dressed matron I expected, there was a very clean, very shiny, very sporty looking Sportster. It was impossible not to include her in my gaze. We expected to find bicycles, not a breath-taking Harley-Davidson. No use denying it. Not every Harley-Davidson is a caricature of an overstuffed sofa equipped with Magic Fingers. I tried to think of my own beloved Royal Enfield Bullet, loyally dripping Castrol 20W-50 onto the garage floor, 250 miles away — while I gawked at another man's motorcycle. Feeling like a stalker, I took a picture and closed the door behind me. And locked it. 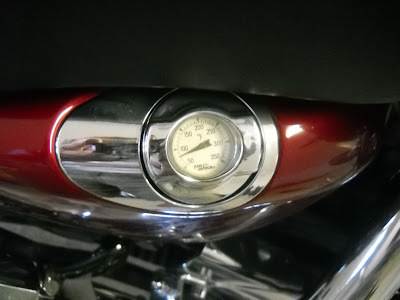 Like a piece of jewelry, a temperature gauge graces the cap of the Harley's oil tank. Those are nice looking bikes but those RE's and Triumphs' are what can take you back in time. They are show stoppers too-the roads are not polluted with them. People often ask me what year my Triumph is and are surprised to learn it's an '08. I am so close to purchasing an RE...and then you've go and put me off with the "Royal Enfield Bullet, loyally dripping Castrol 20W-50 onto the garage floor" comment. OK, last chance...here are my options as a recently licensed motorcycle rider. A new 2009 RE Bullet or the newly released Honde CBR250. Do I go with style or reliability?? C'mon now...last chance to sell me on the REs. The first rule of life is "never recommend anything but a Honda." I even wrote a blog post about it. That said, I DID own a Honda CB250 Nighthawk and ended up selling it. I kept the Royal Enfield. RE really something an american shld try.as it has not changed .the gears are on the right side which is amazing n different from all hogs. I rode my royal enfield in australia and people kept asking me about my bike. I said its not bike ... its bullet. 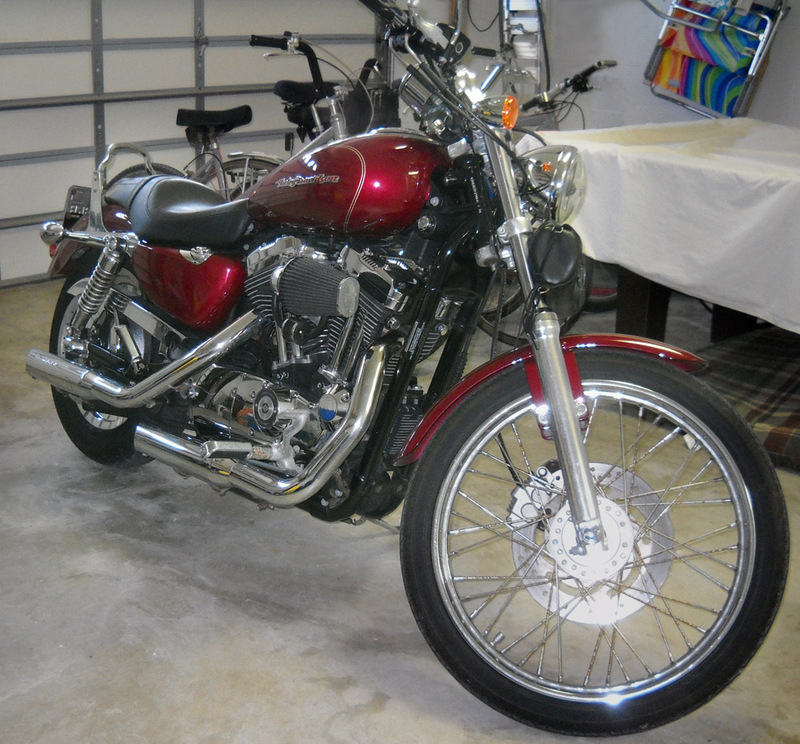 Harley on the other hand is twin engine thing which is powerful but lack the century old charm.